You can whip up a batch (or two) of these Sunday night to take with you to work all week long. You know how it goes: Once 4 o'clock rolls around, all diet bets are off. Your stomach is grumbling and you'd kill for something sweet. What you need is a healthy, homemade sweet that will satisfy this impossible craving. 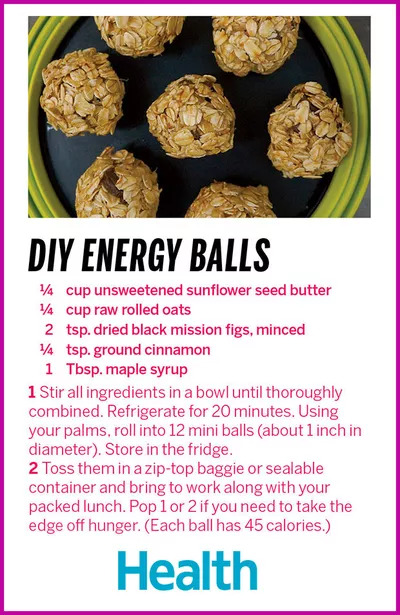 Enter no-bake energy balls. You can whip up a batch (or two) of these Sunday night to take with you to work all week long. Because they provide a dose of healthy fats and natural sweetness, they're delicious and nutritious. And bonus: each ball contains only 45 calories. So you can feel good about popping one (or two) when the urge to splurge strikes. Consider your cravings, conquered.